There was this cat. And his Mom. They lived in a homeless camp near a Costco store. Jim died, he left behind his cat, he was 16, they’d been together forever. She needed help feeding the cat. But she hated to ask because she knew others had it worse. She lives in a homeless camp and she’s worried about others having it worse? She collects cans and bottles but these past few weeks have brought less cans and bottles. She said more people seem to be returning them since the deposit doubled to ten cents. You can read the Wall Street Journal but this homeless woman collecting cans and bottles could pretty much tell you the same thing. Economic indicators pointed downward, her bottle returns had decreased. She could not afford cat food. When I arrived, I saw her bending into the curb and picking up cigarette butts. That’s something that gets me. When someone picks up someone else’s cigarette butts to smoke the last few bits. I asked about the cat. She said her arthritis was really hurting and she could not carry the cat and the carrier, so the cat stayed at camp. She described the cat, he was a redhead and he liked to cuddle, and he sounded glorious. I asked for a photo, she said she did not have a cell phone. “Do you know how expensive those things are?” I nodded yes, as I silently thought about the phone in my pocket that I take for granted. She was not a young woman, and you could see that she hurt. But you could also see from her eyes that she did not do drugs, you could smell from her breath that she did not drink. There was also something else that caught my attention. I did not smell cigarettes. But she had been picking up butts. So I asked, why was she picking up the butts? But it’s not just the butts she picks up. She said whenever she can, she also picks up the trash that others leave behind. And sure enough, the little stretch of gutter where she was standing was clean. She said that sometimes people see her and call her trash. But she picks up trash. She knows the difference. She wishes they would too. I’m standing next to a Saint of a Woman. She’s homeless and caring for her dead friend’s cat, collecting cans and bottles that aren’t there, so she can pay for cat food she can’t afford, and all the while spending her free time picking up someone else’s trash while others tell her she is trash. People drive by in droves, in and out of the Costco lot. 16 days from now will be Thanksgiving. Some moments leave me drained. And some moments leave me drained even more. This was one of those. The Pongo Fund is a small-but-mighty volunteer driven and award winning 501c3 charity that has saved the lives of more than 100,000 dogs, cats and horses by providing them with high-quality food and lifesaving veterinary care when they need it most. Keeping all of them safe at home and out of the shelters. And we do all of it for free. We push the boundaries every chance we can and thanks to you we feel like we can do anything. Because everything we do, we do together. Being there for those when they need us most. I can’t tell you what happened last night at The Pongo Fund’s Midnight Veterinary Clinic. I want to, but I can’t. The words are not there yet. But I will tell you about a cat and a man and I can also tell you that what took place under the moonlight last night were some of the most special moments I’ve ever seen. On the pitch black ride back to The Pongo Fund there was nary a word spoken. We were exhausted. Mentally and physically. But I will give you a taste of what it’s like to be there with us, because I truly wish each one of you could see this work up close and personal. We hope to soon begin inviting people to ride along with us on PONGO ONE and when that happens, if nothing else, I promise you will be changed forever. Among the crowd of people and pets that began lining up long before we arrived to this special place that cares for victimized women in distress was a lone man, on his bike, towing a small trailer. He was riding by and saw our mobile hospital. 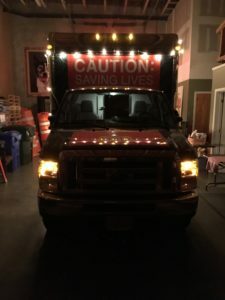 The front of our truck reads SAVING LIVES, so he stopped. And while the majority of services were not available to him because the place we were cares for only women, the compassionate volunteer staff made sure he was heard. And then they came and talked to us. And we said yes, we will absolutely see them, because a life was at stake. This is when you might want to sit down. Because what I’m going to tell you is going to hurt to read. But it’s going to leave you changed in the best ways, to remind you that none of us knows what it’s like to walk in someone else’s shoes. Wade got Squash the Kitty several weeks ago when a friend went to jail. Wade served time in prison, so when his friend asked for help, Wade was there. Homeless, but living in a van, he knew he had it better than others. Squash was his first kitty and he was smitten bigtime. Shortly thereafter their van was towed. Wade was not inside the van, but Squash was. And now Squash was gone. Wade got to the tow yard fast as he could but no Squash; he’d gotten out when the doors were opened. That was six weeks ago. And almost every day since, Wade made the many miles trek to the tow yard to look for Squash. Because he promised to take care of him. So he went day after day after day, each time leaving empty handed. This homeless man fought his shyness and spoke with everyone he could, he posted fliers, he walked the streets. And then one day a woman nearby said she’d seen Squash, she said he sits on the corner every day. And the next day when Wade went back, there was Squash, sitting on the corner, like he’d been waiting for Wade the entire six weeks. That was just three days ago. Somehow Squash had survived weeks without regular food or water in an area he’d never been. Waiting on the corner for the man he knew was looking for him. Wade could see that Squash had faced some tough times during those six weeks. Among other things, Wade noticed that Squash was chewing incessantly underneath his tail. And after these six weeks of agony, all that mattered to Wade was getting Squash some care. But financially, he just could not afford it. Squash rides in the most comfy traveling Kitty Condo you’ve ever seen. It’s huge and it’s stuffed with blankets and toys and love, secured tight to the trailer that rides behind Wade’s bicycle. But Wade knew that Squash was hurting and he needed help. And that’s why when we heard the story we said yes, we will absolutely help. As the night grew darker we were finally able to get Wade and Squash inside the hospital and we were shocked by the wound we found. That’s what Squash had been licking and it had to hurt like heck. He was doing all he could to soothe himself but in turn, the infection was growing. Dr. Melissa and Dr. Robin got to work, cleaning the wound and administering antibiotics and talking with Wade about how to provide continued care. And while Wade listened, he gave me one of the kindest compliments I’ve ever received. You see, I’m the Executive Director of The Pongo Fund, but I’m also the guy who sweeps the floor. When we’re on the road I’m inside the hospital, shoulder to shoulder with the veterinarians, doing whatever I can to help but not be in the way. I also ask questions so I can learn. While we were treating Squash I asked about medications. And in that same moment I mentioned to Wade that I’m not a medical professional, I’m just the guy who drives the hospital. He looked me in the eye and said “That’s ok, everyone’s got to do something and if not for you, you wouldn’t be here tonight helping Squash.” He broke it down so simply. Everyone’s got to do something. And even though I’m just the driver, he still thanked me sincerely for being the driver, and it meant the world to me. As we neared the end of treatment for Squash we needed to fit him with an E-Collar, something that Wade was certain would not go well. But we use the most super soft E-Collars and if we had to wear an E-Collar, this is the one we’d want to wear. And that’s how The Pongo Fund rolls. We do not cut corners just because someone is homeless. Just before we put the collar on Squash, Wade leaned close and told him what was coming and he asked him to be good about it. And he told Squash that if he wanted him to, that Wade would wear an E-Collar too. Luckily we had one in Wade’s size if needed. But Squash rolled with it and the collar went on with ease and then Squash sauntered back into his condo and burrowed into the blankets like nothing had happened. We knew he was feeling better already. Wade and Squash left with full bottles of medications, and that blew my mind. These meds are expensive, yet providing just a 2 or 3 day dose wasn’t going to do the trick. And that’s why I’m so proud to work with all of the veterinary professionals who share their time and skills with The Pongo Fund. Because they treat these cases with the same care they treat all of their patients. So when Dr. Melissa and Dr. Robin tell me we need to give away entire bottles of antibiotics for free, we do it. Because it’s the right thing to do. Wade thanked us many times over; we know that Squash did too. They stepped down three steps and exited the hospital, making room for the next patient to arrive. We still had hours to go, still so much more to do. My heart is still full from the work we did last night and I look forward to telling you more about it soon. Oh, and one more thing; we’ll be back to this sweet love-filled place again in just a few weeks. Because if providing free veterinary care at a midnight clinic for our community’s most fragile souls is what needs to be done, than hell yes, that’s what The Pongo Fund is going to do. And we are honored to have you there with us too. Tonight we go where we’ve never gone before. Our first Midnight Clinic. To a safe hamlet that welcomes marginalized women with love and compassion during their toughest times. Many of these women have little, and many of them have even less. But ask them about their animals and they shine; animals who are their everything. 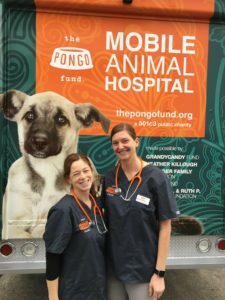 So that means when you’re getting ready to head out to dinner, The Pongo Fund, along with our compassionate team of Dr. Melissa and Dr. Robin, will be piloting PONGO ONE, our Mobile Veterinary Hospital, to this soft and gentle place to provide free lifesaving care for all in need. We don’t know what we’ll see so we go with everything, including a ready surgical suite, digital xray, full laboratory, food and more. Thank you to the special woman who is generously sponsoring tonight’s powerful event. Your heart loves for all. Please give us a call if you or your business would like to sponsor another one of our Midnight Clinics because there are several more coming. Being there for those when they need us most; meeting them where they are and when they are. This is a hard one. Jack and Oliver were discharged. I missed them by less than 10 minutes. As someone told me, maybe I was supposed to miss them by ten minutes. Maybe saying goodbye would have been too hard. But still. Jack shared his words carefully, not just with me, but with the nursing team too. I’ve found this to be the case with a lot of homeless people. Sometimes saying little is their safe haven. Oliver, on the other hand, loved to talk. He squealed with delight every chance he could, using his voice, his ears, his paws, whatever he had, to speak his love. When he sat up and wrapped his paws around my neck and pulled me close, when he slurped my face like a cupcake with frosting, I melted on the spot. One of the many lessons I’ve learned these past few years, is that we must meet people where they are, on their terms. Not just where they are physically, but where they are emotionally. And that’s why The Pongo Fund sometimes bends without breaking. Rules are rules are rules but if someone in dire need of help just can’t meet all the rules then sometimes we need to adjust the rules. And that’s why everything we did for Jack, we did on his terms. Jack and Oliver hit the jackpot when they met The Pongo Fund. They both knew it too. But while Jack struggled with it, Oliver did not. He was a therapy dog, never far from Jack’s side. That was his job. One of the nurses told me they could barely get those two apart. One time when Jack was too weak to walk one of the nurses volunteered for Oliver’s potty break, but Oliver struggled to leave Jack. Yet Oliver saw me differently, somehow trusting me like an old friend. Maybe we didn’t speak the same language in words, but we spoke the same language in love. Me and that dog, we had a thing. 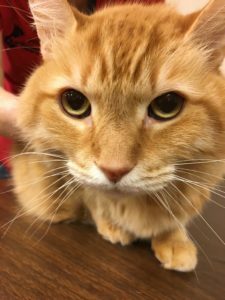 The Pongo Fund brought Oliver food, bedding, treats, leashes, love and so much more, along with all that great veterinary care from Dr. Alayson and CVT Marie. But at the same time we were there for Jack every step of the way. Jack did not want to go back to the homeless shelter, so we worked on a plan to get him housed for the next 30-60 days. 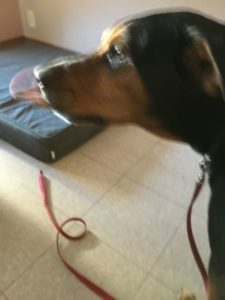 We had things set up with food, shelter, someone to regularly check on him, someone to drive him to medical appointments, pretty much the full-meal-deal. Because making sure Jack was safe meant that Oliver would be safe too. That’s one of our mantras: by helping one we help both. But conversations with Jack were both brief and delicate, because Jack was still unsure why a total stranger would be doing all that we were doing. The offer of any help was not easy for him to accept. So it was baby steps. We were there for Oliver, and Jack appreciated that, but each time we also made sure to do everything we could for Jack. And it was working, with Jack opening up a tiny bit more each chance we had. The discharge notice came earlier that morning; there wasn’t much of a plan. And that’s how we missed him by 10 minutes. And as much as I wish it were different, that’s what the world had planned. In this line of work, it’s imperative to celebrate the small victories. Jack and Oliver, they are just two of the tens of thousands The Pongo Fund has touched during these past few years. And despite the frequent sadness of many situations, there are also many things to celebrate. And at times like this we need to quickly find those things and celebrate them for the blessings they are. Jack and Oliver both had clean, warm beds to sleep in, good food to eat, fresh water to drink, and a place where they were safe. I don’t know the last time they had those things in such abundance. And this is really cool. As I’ve noted several times, Jack didn’t say much. But here’s one of the small victories, and we never saw this one coming. When Dr. Alayson, CVT Marie, and I left their room and were just one or two steps out the door in the hall, all of a sudden Jack was a chatterbox, talking to Oliver about all sorts of things. A reminder that none of us know what it’s like to walk in someone else’s shoes. Jack didn’t easily talk to us, but he had no problem talking to Oliver. And here’s one more thing to celebrate, but you may need to read this part twice to really get it. Because sometimes finding the celebration is like peeling back an onion. Not right there in the first or second layer, but just below that. When Jack left he was not in the best of shape by any means. But that’s his new normal. As he left, I’m told it was more of a shuffle than a walk. But still, it was something. He was weak, but yet he managed to gather the things that were most important and somehow hold them tight. A big bag of dog food for Oliver; the stainless food bowls and leashes and new collar and Oliver’s toys, those are the things he took. He also made sure to take the new jackets we’d bought for him, socks, hat and more. Remember when he asked for a jacket? We got him two! I’m not sure how he carried all of that, but he did. Sadly, he was unable to take Oliver’s new bed. Truly, it was huge, so I took that with me and the next dog to use it will enjoy knowing that Oliver used it too. But maybe the most important of all, was that Jack found a way to take with him the prescription medications Dr. Alayson had prescribed for Oliver, the ones she’d filled right there on the spot. If only you could have seen what I saw in that moment. 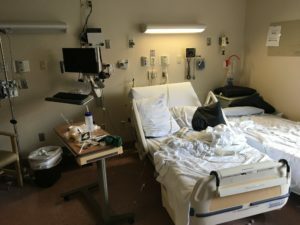 Jack in his hospital bed, blankets pulled tight to fight the chill, surrounded by all of his own medications. And there, a few feet away, were medications for Oliver. There was something perfect about that moment. Dr. Alayson even wrote a daily prescription log with check boxes to make sure Jack knew what medication to give and when to give it. There was no computer, no fancy paperwork; just a handwritten page with words and boxes. This is veterinary medicine old school. And a reminder that sometimes all the fancy equipment in the world can’t take the place of human compassion. Being there for Jack and Oliver. Godspeed and Good Health to you both. I would be honored if you share this post. Even if you stare at this photo for ten minutes it’s still not enough. And if you want to be a veterinarian or a vet tech, stare even longer. Because what you’re looking at you’ve likely never seen before. I know I haven’t. And I was there. Dr. Alayson, medical director of one of the area’s largest veterinary clinics, and Marie, her lead CVT, doing their veterinary work in the patient room of a human hospital. Honestly, I don’t know how to tell you what I saw today. We were there for 90 minutes, scrunched into the corner, with homeless Jack watching from his bed, hooked up to tubes and lines and observing every detail as 11 year-old Oliver got the royal treatment head to tail. Right there on the spot we did the full exam and administered treatment. And in the next few days we’ll have the groomer onsite for a big bubbly Oliver bath and we’ll get a masseuse there too, to massage Oliver’s achy bones like never before. Oliver is the best friend in the world to this man who has little and cares for even less. But Oliver is Jack’s everything. And by helping one, we know we’re helping both. Because even the homeless deserve the best care ever. We left behind medications and hand written instructions, bags of food and treats, and all sorts of stuff for Jack. Because when you have more than you need, you must share with those who do not. And that’s what we did today. We shared the love. And it felt great! 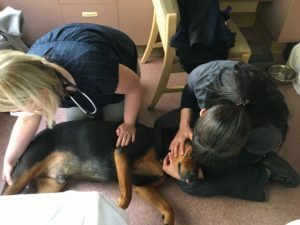 Breaking boundaries to do what no one else does, these are the rare moments that The Pongo Fund is making common, by asking veterinary professionals to donate their time to provide the kind of care that goes beyond words. I’m struggling to write this now, I don’t know why but I am. I was there, I watched it all, and I’m still not sure how to describe it. But what I can tell you is this, that I cannot be more proud than I am right now to be part of The Pongo Fund. We have become the Little Engine That Could. And we are rewriting the book on what it means to do something special. As for Jack, unable to leave his bed he watched with pride, the Proud Papa who knew what was happening was something deeply meaningful. As for Oliver, he soaked up the attention like the love bug he is, splaying flat out on the floor every chance he could for belly rubs and treats. Even cuddling us while Marie gave him the best mani/pedi ever. And when he wasn’t doing that he was tossing his little baby to and fro, squeaking with delight that he had new friends to play with. And when we were done, Dr. Alayson, Marie and I took Oliver on the biggest walk he’s had in ages. Seriously, when’s the last time your veterinarian took your dog for a walk? There is a lot more to tell, but my words are locked up right now. I know what to say, but I don’t know how to say it. My heart hurts. Two TV stations asked for info on this story, but out of respect we declined. Because what happened today was personal and private and is to be shared only with those of you who are part of us. To Dr. Alayson and CVT Marie, part of the magnificent team at VCA East Mill Plain Animal Hospital, I bow down to you with the utmost of respect and appreciation. What you did today is the stuff of legend and has set the bar higher than ever before. This post deserves to be shared, so please share near and far, because people need to know that business as usual is not enough anymore. That breaking boundaries will make the biggest difference, and that’s what we did today. To nurses everywhere, thank you for letting The Pongo Fund be part of your heart. Because two legs or four, we are all in this together. Being there for Jack and Oliver. I don’t know where to start. Seriously, I’ve been staring at this first sentence for the past hour. My heart hurts. There are so many things in life that I cannot change. Jack and Oliver are part of that. Jack and Oliver, the homeless man and his dog who are together in Jack’s hospital room. Together because the wonderful nursing team decided that it was the right thing to do. I saw them again today, and in so many ways, I almost want to move into that room with them. You have no idea how much I love them. If you could see these two, oh man, your heart would burst. The moment I walked in I found Oliver curled up on his bed. That’s the ginormous bed that you helped us get for him because he had no bed of his own. Granted, Oliver was not shy about sharing Jack’s bed, but the guy has lines and tubes and he deserves some bed of his own. So it took Oliver a day or two to understand the new bed was HIS BED, and from that moment on, that’s been his place to hang. And from what I hear, he loves it. The moment I walked in he began to squeal. You know the squeal, it’s the sound we all dream of. Part purr, part Ella Fitzgerald, part Joni Mitchell. And that’s before he even saw I had a new bag of food, more treats, and a soft little baby for him to cuddle. After a quick greeting to Jack, I was on the floor with Oliver. I think I massaged every part of that giant body of his, even some little tickles on his tongue. I had the best time ever. But maybe the biggest bonus of the day was that Jack finally opened up a little bit. He’s still pretty careful with his words, so if you’re expecting a long story, he’s not your guy. But the few words he did share was a step in the right direction. And the third time I asked him if there’s anything at all that he needed, he finally said yes, maybe there was. What is it, I’m wondering, anything, just tell me and I’ll get it. His current coat is battered and its heavy and when it gets wet it’s too waterlogged for him to wear. The days are getting a bit warmer, so he thought maybe a lighter weight coat would be nice. Seriously, that’s what he asked for. He rubbed the genie bottle and his wish was for a coat. Nothing fancy, color doesn’t matter. Just something he could wear outside with Oliver. Was there anything else? Anything? Anything at all? I kept hinting at different things and then he looked at my sweatshirt and said maybe a sweatshirt would be nice too, maybe he could wear that when he didn’t need the coat. A coat and a sweatshirt. No color preferences. No fancy brand. Just a basic coat and a sweatshirt. And that’s why very soon I’ll be out shopping to buy Jack what may be the first new coat and new sweatshirt he’s had in years. I don’t know why, but I’m a bit nervous. And I’m honored more than you know. Thank you to everyone for helping us meet the match for Jack & Oliver. I saw them again today, it’s a tough road ahead. Jack has some heavy healing to do, thankfully Oliver is there with him. But this will take more than just Oliver. When I walked in both of them greeted me happily, one of them a little more happily than the other because of the treats in my hand. I also brought along a giant bed, because this is a giant dog. It’s such a heartfelt feeling to see all these things lined up along the wall; fresh bag of kibble, the bed, the food bowl, water, treats. Oliver is such a chill guy, but he got so excited when he saw me that he went to his food bowl and picked up a few kibble and dropped them at my feet. He waited until I picked them up. They were for me. The ultimate compliment, he made me part of his pack. I got down on my knees to thank him, gave him some hugabugs, some neck noodles, then I found his sweet spot, the smackem spot on his heinie and I rumpathumped him a few times and got his generator leg going bigtime. His tongue was out, flailing this way and that. That’s one of the photos, sorry it’s blurry, but my good hand was being used for the rumpathumps and this is the best photo I could get. But the big circle there, that’s his tongue, happy dancing. It’s like it had a life of its own. His Providence nursing team is just the best, they greeted me with a smile even though I’m carrying a giant dog bed, when’s the last time you saw that in a hospital? And yet, they were so happy to see me and they know I’ll be back again soon. Seeing Oliver happy helps Jack too, and that’s the least I can do, right? It’s a beautiful day in Portland, sunny skies, the birds are out, a day like this is a special gift. Yet this is still reality. 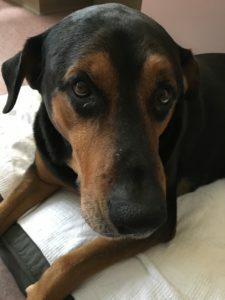 Jack is in the hospital, he’s not well; he’s homeless otherwise. Thankfully the most important thing in the world is there with him, but other than that, a sobering reminder of how life works. I’m talking to Jack about some things he might need, and as I looked around the room it hit me. He’s got nothing. These are hard moments. The sunny day is not there for Jack, he keeps his window blind drawn. Oliver is the sunshine for them both, of course he is. Man’s Best Friend. I’ll be there again soon. This one will hit you hard. 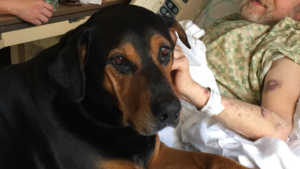 Providence Hospital is one of numerous hospitals throughout Oregon who turn to The Pongo Fund when their patients have pets. Jack and Oliver are the best of friends and if you saw them you’d see how tight these two are. They’re also homeless. Which means when Jack ended up there, Oliver had nowhere to go. Some hospitals tell people to leave their pets in the car, or to chain them outside. Mike has no car, so Oliver came inside too. And that’s when one of the superhero RN’s called The Pongo Fund. Our Emergency Kibble Response Team had four Emergency Kibble Couriers on the job yesterday, and for this call I had the honor of responding. Our EKRT members carry emergency supplies with them, so I was able to get there quickly with food, treats and other supplies. Walking into a human hospital carrying a big bag of dog food brings some odd looks, but that’s ok, this is the work we do. Oliver is a gentle giant, honestly, the sweetest guy ever, his mouth soft as a feather. He sits for treats, he plays with his baby, he jumps back onto the bed to nap with Dad. Oliver is the best medicine. But none of this would have happened were it not for the nursing team who took the lead and called Pongo. Nurses save the world every day. And yesterday, they were there for Oliver too. The best part, now Jack and Oliver are part of The Pongo Fund. From this day forward we’ll be there for them every step of the way. Food, veterinary, the works. 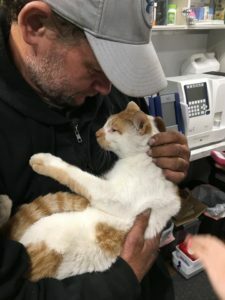 We’ll be stopping in to see them again later, and if you’d like to donate to help these two, please click here http://bit.ly/2oUZeYh and write Jack & Oliver in the comments. I hope you SHARE this story so that others will also know the great work that we do. For Jack and Oliver and for the nurses who love them. It’s not a selfie. It’s a reminder. A reminder that sometimes you have an opinion, and sometimes you are the opinion. Like this moment. When someone else’s opinion reminded me of how hard the hustle can be. Even if you just want to wash your hands for lunch. I’ve been helping the homeless since college. And yes, I know what it’s like to spend chunks of time on the street. But I did it on purpose, with the good fortune of knowing I could leave at any moment. That’s the blessing. And that’s why working with the homeless is still such a strong focus area for me and for The Pongo Fund. Because the need is great. Because no one should suffer. This is a big and heated conversation and there’s more opinions than answers. But when they have animals, when they need help, when they ask for so little, it’s time to put our opinions aside and do what we can. That’s my opinion. 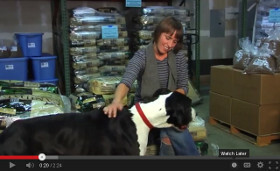 The Pongo Fund is working on a new project to help the homeless and their animals. I was walking the streets and stopped into a small place for a quick lunch. 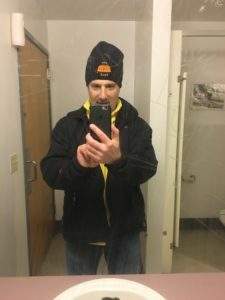 I was adorned in a Pongo cap, a second-hand black jacket, a well-worn yellow fleece, blue jeans, basic shoes. I’d shaved a couple days earlier. My hands needed some scrubbing; I asked about using the restroom. The woman was busy, maybe she didn’t hear me. I asked again. She said it was for customers only. I said I wanted to wash my hands then I’d be back to order. She shrugged, like she’d heard it too many times before. She said I’m really not supposed to let you, but she pointed, I quickly followed before her kindness went away. I felt dirty as I walked to the back corner, and that’s when I got a glimpse of myself in the mirror. There was no other acknowledgment, other than me feeling like it was time for me to leave. I had money in my pocket, I really did want to get some lunch. But I left. Not because of her. Just because. I passed lots of people bundled on the sidewalk and I wondered where they wash their hands when they eat lunch? But I knew. The woman, she was young with kind eyes. I felt bad for her, what a difficult burden to bear. Working in a neighborhood surrounded by the harshness of winter homelessness can’t be easy. She wasn’t mean. She was just doing her job. Protecting the restroom because before you know it, you’ll find a line of people bathing there. And that’s not right either. But how will she bounce back from these moments, of being asked to quickly judge someone’s ability to pay for lunch, and then based on that, allowing them the secret instructions to where to restroom is? She is too young to carry that weight. I had clean hands but felt dirty. An older woman sat on the wet sidewalk. She held two cigarette butts, one in each hand. These were not the kind of cigarettes you buy, these were the kind that had already been someone else’s cigarettes before. She talked to herself. She looked sad. A few feet away a woman stood with her lifetime of possessions overflowing from a small cart. She had a backpack next to her cart, a small dog inside, head sticking out. She wore a front pack with another small dog snuggled tight. It was below freezing, the wind was no one’s friend. The street was their home. How did she stay warm? An elderly man in a wheelchair, he was missing a leg. He had no coat, just a sweater that looked like it knew many winters. He pushed himself along; his arms the motor. The remaining leg grabbed the pavement in unison, pull, push; pull, push. He saw me watch him. A dog on his lap. A woman with a walker struggled with a small bag draped over the handles. A small dog walked alongside, connected to a small leash in her hand. I hope the bag held lunch for both of them. She had no coat, the dog did. Sometimes I feel lost in my own city. My solace was knowing we’d be back again soon.